CHICAGO (NEWS RELEASE) (WLS) -- The month of March in Chicago belongs to kids served by Mercy Home for Boys and Girls. That's when Mercy Home rallies the public in support of a solution for kids in crisis. Mercy Home's March for Kids relies on hundreds of volunteers who help us collect donations at St. Patrick's Day parades and events, businesses, schools, and churches. These donations save lives by providing abused, neglected, and at-risk children a safe place to live, healing from emotional trauma, and education to help them build futures of hope and independence. Volunteer to collect donations at parades and events, or hold collections at your office or business. Go online and make a donation in support of our kids. CLICK HERE to learn everything you need to know to join the March. Volunteers will again be out in force on Chicago-area street corners and St. Patrick's Day parades throughout the month of March, collecting donations and raising awareness that help Mercy Home for Boys & Girls give at-risk children a safe place to live, therapy to heal from trauma, and education to help them build independence. 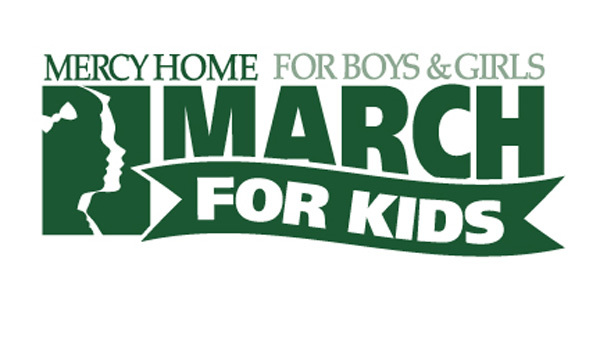 Mercy Home for Boys & Girls' March for Kids campaign is the public's chance to make a lasting difference in the lives of children who come from environments marked by poverty, violence, and abuse. The campaign will feature teams of street volunteers who will collect donations to Mercy Home while handing out Mercy Home Shamrocks as a way of saying 'thank you.' Mercy Home raises 99.9% of its operating funds through private donations like those generated by its March for Kids effort. Mercy Home is calling on all interested volunteers to help make this effort a success. Any individual, business, or group can help provide a safe and supportive home for children in need just by signing up to be a Mercy Home March for Kids volunteer. It's a fun and unique way to celebrate St. Patrick's Day, complete a Lenten, school, or family service project, or organize an office team-building initiative. Go to mercyhome.org to sign up, or call (312) 738-9560. The public can also donate directly to Mercy Home online at mercyhome.org. Mercy Home President Rev. L. Scott Donahue praised supporters for the impact they have on young people who for 130 years have turned to the Home in times of crisis. "I see children who've endured terrible hardships in their young lives," Fr. Donahue said. "Yet I'm always inspired by their resiliency and by the amazing things they can accomplish when they have the right care and encouragement-the kind that's only possible because of generous people throughout the country who provide us with the tools Mercy Home needs to bring healing and hope to into the lives of these children." Mercy Home's March for Kids has been held every year in Chicago, under different names, since 1996. For ten years, it was known as Shamrocks for Kids before being rebranded and expanded in 2014. Today, Mercy Home's March for Kids involves significant promotion from media and corporate partners, involvement in several area parades and events, fundraisers in bars and business, and a volunteer street team of 1,000. Visitors to mercyhome.org/marchforkids can learn everything they need to know to join the March and keep up to date on news and events from the campaign. Also look for information on ABC7 Chicago-our generous television partner for Mercy Home's March for Kids. Mercy Home for Boys & Girls (mercyhome.org) has been a solution for kids in crisis since 1887. Through its residential, aftercare, and mentoring programs, Mercy Home offers a safe home, emotional healing, education, and life-changing opportunities for more than 600 young people every year. It gives children who have suffered abuse, neglect, poverty and even abandonment the therapeutic, academic and vocational support they need to heal from the traumas of their pasts and build success for their futures. Mercy Home is 99.9% privately funded and operates at three locations in Chicago - a home for boys in the West Loop neighborhood, a home for girls in the Beverly/Morgan Park community, and a home for AfterCare residents and families in South Shore.